Getting your content shared is one of the major tasks that every blogger look forward to accomplishing. The more your content is shared the more popular your personal blog or business website becomes. Encouraging people to share your content is pretty challenging despite your content being exceptional. There is a range of social share plugins for WordPress platform that will increase the sharing of your content. Social Warfare is one of the best choices of many WordPress bloggers and it’s used on many popular blogs as well. The developers claim this plugin to be an incomparable and unique that will hook your visitors to share what they love. Read on to explore more about Social Warfare plugin in depth. Social Warfare plugin is one of the best social sharing plugins in the market and delivers a better user sharing experience. There are some exciting features that Social Warfare has in store for its users. The social sharing buttons of this plugin are easily configurable in your WordPress website giving you the freedom to craft customized content for prevalent social networks. Every time your content gets shared the plugin uses customized pictures and messages for each social media platforms. This optimizes the social media posts for every network on which they are shared, increasing the perceptibility of your content and attracting more visitors and customers to your site. What is the best part ? This plugin is available for free in wordpress.org repository as well as a premium plugin exist for more features. As you begin to install this wordpress plugin the software prompts a custom built user interface that can be configured according to your requirements. There are sub-sections in the control panel that are easy to understand and fill. There is an assortment of functions that you can set such as – whether or not you would like to be mentioned in the tweets or the choice of social media icons on your website or where the desired social icons should be placed on your website. This and much more! All this can be done by new drag and drop user interface integrated with the social warfare plugin 2.0. You have the option to display the count of social shares and even to set it to display only once a specific count is achieved. 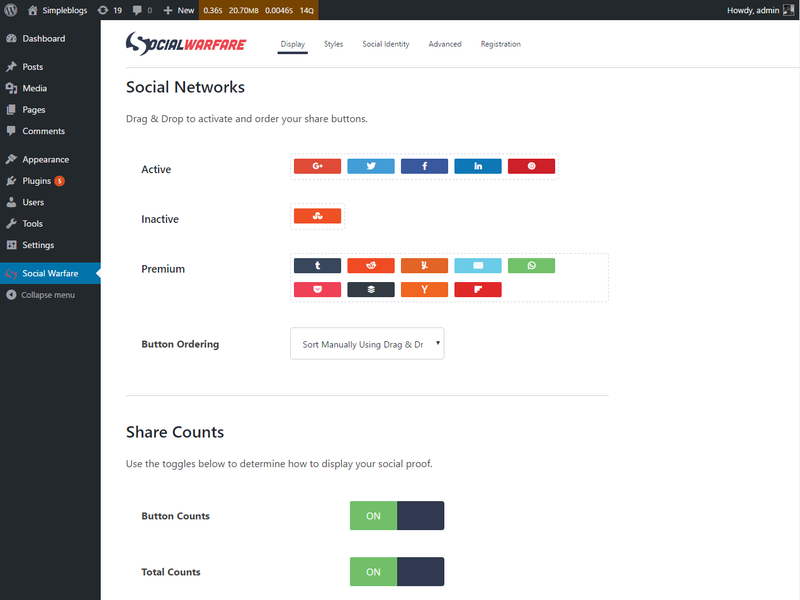 The social share buttons can be given a customized color scheme according to your choice or selected and you can select one from the six themes that come with Social Warfare to make your social buttons look attractive. The buttons are animated and you can control the feature to float the sharing buttons. There are four different themes using which the click to tweet feature can be configured. If you prefer to use a different style you can make use of the CSS. The link shortener tool may or may not be used. The option at the control panel allows using Bitly service which you can enable with your username and API key. Keeping a track of your customers is important and Google Analytics in the plugin will help you maintain an exact count. Popular posts are a good way to grab the attention of the visitors instantly, the popular posts widget can be added to your website easily from the WordPress admin panel through the widgets page. The software is simple to set up and the widgets are flexible and simple to use. Once the plugin is installed on your website you can start using it. Social Warfare has a variety of features, some of which are free while the others are chargeable. The free WordPress plugin has limited features over the premium plugin version. The below will give you a glimpse of features in both plugin versions. You have access to Twitter, Pinterest, Facebook, Google+ and LinkedIn for free whereas if you wish to unlock social share buttons to other websites such as Reddit, WhatsApp, Pocket, Buffer, Email, Tumblr, hacker News, StumbleUpon, Yummly and Flipboard you would have to unlock them for a certain price. The count of shares can be displayed for free, however when it comes to displaying the number of tweets then you need to be a premium member. While you can have the option to display and customize the most popular posts of your website you would have to pay to get the ‘hover pin button’ that would appear on every picture of your content making it extremely simple and increasing the chances of the image being shared on Pinterest. While there are many easy and simple widgets that come for free, there are some wonderful functionalities that are unlocked for a specific amount. Features such as Google Analytics, link shortener service, button-click tracking, Rich Pins, Twitter Cards found in SEO plugins etc. are all features that help you in bettering your website and increasing your circle of customers. According to the options selected by you while configuring Social Warfare, the social share buttons will feature on your website. 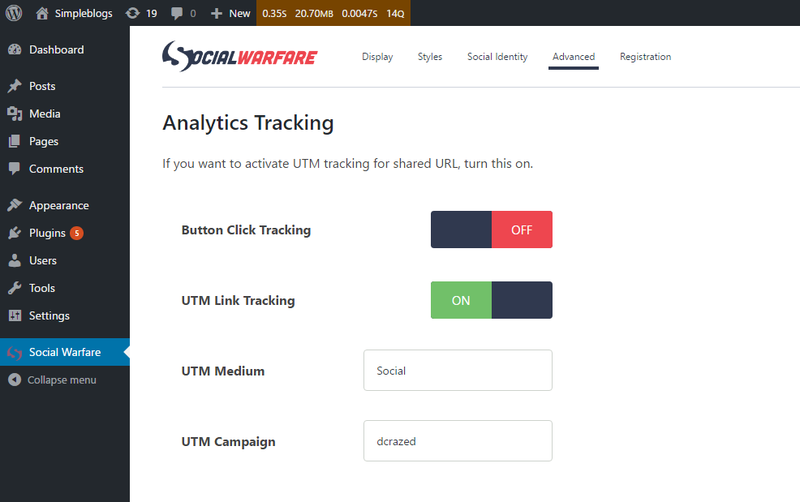 What makes Social Warfare different from the other plugins is that every post and page of your website will feature a customization panel on the edit screen which can be used to create a message that can be used by the visitors while they are sharing your content on the social media platforms. If you choose not to select them the posts will be shared using their title. However, this enables the sharer of the content to add his/her views which are also a perk to your website’s content sharing capabilities. Smartphones have made life easy and people prefer to look up things and have all their work done through a smartphone. So, it is likely that most of your visitors will access your website through a smaller device such as a smartphone or tab instead of regular PC. You should be prepared to have your social sharing options open even if your website is accessed from a smartphone. Social Warfare offers responsive social share buttons which look perfect irrespective of the device they are being viewed from. So, your social sharing doesn’t get hindered. Content is important but crowd these days seem to be more attracted to the images. What most people don’t know is that different social sites accept different sizes of images. Twitter, Facebook, LinkedIn and Google+ accept horizontal images whereas Pinterest prefers vertical images. Social Warfare has you covered and it will show appropriate images automatically on sharing. Another effective feature which lets you add the text of your choice before tweet can be sent. There is a Twitter icon that is embedded by Social Warfare in the WordPress post editor which needs to be clicked in order to use this feature. You can create your text which will be added to the post. When the content is published the created text will also be included with the ‘click to tweet’ below the quote. There is no limitation to the number of quotes that can be created. This feature allows you to upload an image optimized for Pinterest and it is enabled by switching on the below feature. All the images in your content show a pin button when the users hover over the image. This is the best way to increase Pinterest pins count. Customers don’t like to wait and they move to another website if the loading time is huge. Most plugins with massive features tend to slow down websites but that is not the case with Social Warfare. The site performance is not affected by using this plugin as it loads the social media icons lightning fast. Irrespective of the number of images and posts, the plugin doesn’t hinder the loading time of your website. Sharing buttons your articles is important and when you have the feature to show the share count of social networks it works wonders. It has been seen that some users tend to share content which is highly shared. The total share count can also be displayed with the help of this premium plugin. There are many ways to catch visitor attention to like, share your social media pages. One of them is a social bar that keeps floating in the footer of the WordPress website. The UTM tracking is automatically added to the shared links so that you can find individual share count of any social network in Google Analytics. The target URL customization with the link shortener service lets you share your content as many times possible. Track every share. There are no known compatibility issues when social warfare is used along with popular plugins like Woocoomerce, Yoast plugin, Jetpack etc. The plugin works well with most of the free plugins out there as well. There are three different types of plans which you can subscribe to. 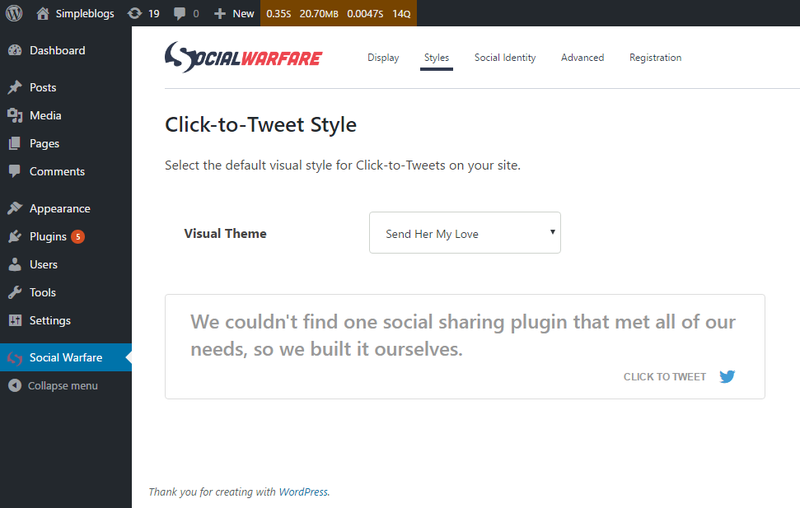 If you select the plans with higher prices you will have options to use Social Warfare Plugin in more websites. The developers are confident which is why they offer a 45-day money back guarantee if you think the premium plugin is not satisfactory. The software hardly seems to have any drawbacks however people expect more free features to be accessible. But the price for which the plugin is available is completely worth it. Social Warfare is a well-documented and easy to use plugin for WordPress blogs as it helps you drive more traffic, increase social shares for your website. There are regular updates and the developers seem to be working on every loophole that comes up. If site performance is a concern then this wordpress plugin will do much justice in your effort to produce a serious social buzz. The plugin is easy to configure and gives you a diversity of options required to share your content. Social Warfare is a wonderful plugin to use and is immensely suggested by many top bloggers. Social media marketing has become important for any website and its success reflects straight on your business. As every business website needs a blog for marketing so is the need of a perfect social media plugin for a better social engagement. WordPress CMS is the top choice among bloggers as it supports many popular plugins. We hope you find this plugin useful and also increase your shares. Have fun and lets us know what you think in the comments below. Thanks for sharing a very informative article with us. Social warfare plugins are really something that helps in giving a different and unique look to our site, whether it be a social sharing plugin or content protection, wordpress without plugins are really useless. Yep, to run a WordPress website you need some essential Plugins. It makes our life much easier. Plugins for SEO, Redirects, Sharing, Caching, and Comment protection are always on my top list. We are using Sahifa theme for our website. I am using business theme of wordpress, but there are number of themes and plugins you can install along with required social plugins with it. I am using social warfare plugin. Great. Nice to know your opinion on the plugin.